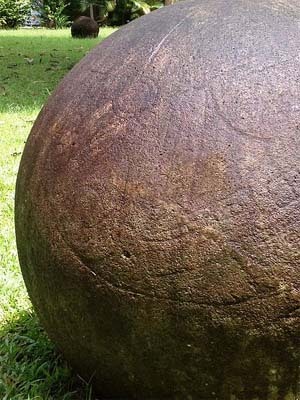 Found deep in the jungles of Costa Rica in the 1930's were 300 nearly perfectly round stone balls. They varied in size from a few inches in diameter, to seven feet across and weighing 16 tons. Scientists aren't sure who made them, how old they are or what purpose they might have had. In the early 1930's the United Fruit Company started searching for new space to plant their banana trees because their plantations on the eastern side of Costa Rica, in South America, were threatened by disease. On the western side, however, not too far from the Pacific Ocean they found a promising section of land in the Diquis Valley. When they started clearing the land, however, workers found something strange: stone balls. They ranged in size from a few inches to six or seven feet in diameter. The most striking thing about these rock spheres was that many of them appeared to be perfectly round and very, very smooth. Undoubtedly they were manmade. As far as the United Fruit Company was concerned the strange objects were just in the way of their plantation. Workers rolled them off to the sides of the fields by hand or pushed them using bulldozers. Many were eventually transported to homes or businesses to be used as lawn ornaments. Before authorities could intervene a rumor that some of the stones contained gold in their cores caused treasure hunters to drill holes in them, load them with dynamite and blow them pieces hoping to get rich. The only thing they found inside the stone spheres, however, was more stone. 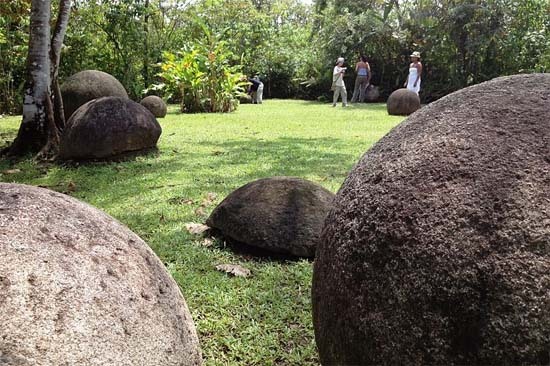 The first archeological investigation of the spheres was done by Doris Stone, a daughter of a United Fruit executive and later the director of Costa Rica's National Museum. Her observations were published in 1943 in the magazine American Antiquity. A few years later in 1948, Samuel Lothrop of the Peabody Museum at Harvard University, while on an expedition to Costa Rica on an unrelated matter, ran into Stone who told him about the spheres. Lothrop, whose expedition was blocked from its original goal by a civil war, visited the Diquis Valley instead and did an examination of the rock globes. While most legitimate archeologists have no doubt the stones are the work of an ancient indigenous people, wild stories have grown up about the spheres suggesting that they are connected with aliens or the lost continent of Atlantis. Skeptics argue that primitive people with basic, non-metallic tools could not possibly have made such perfectly round and smooth stones. However, though many of the stones seem startling round, most of them are not as perfect in shape as they might appear to the casual observer. The best measurements were made by Lothrop in the 1950's, but he was hampered in his observations by the size of the larger spheres and the difficulty of getting a tape measure around the spheres still half buried in the ground. Also not all the balls are perfectly smooth, and many show the evidence of the tools used to make them. Even if the stones are neither perfectly round or smooth, creating them was still a huge effort. Most of them are composed of granodiorite, a hard, igneous rock that comes from outcroping in the foothills of the nearby Talamanca mountains. Most likely the carvers carefully chose boulders that were somewhat round in the first place. This type of rock tends to flake off in layers if there is a rapid temperature change, so the carvers may have heated sections with hot coals, then doused them with cold water. After using this method to get the general shape, the final sculpting was probably done by hammering the stone with other smaller stones made of the same hard material. Finally the surface of the spheres were ground and polished to a high luster using sand or leather. The same process is well known today for shaping smaller stone objects like stone axes and statues. The Chorotega Indians are often cited as making the stone spheres, but they lived further north from where the balls were found. 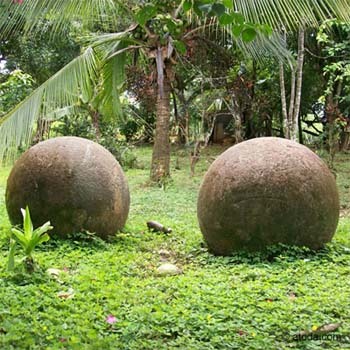 We don't know exactly who created these globes of rock, but it seems likely it was the ancestors the people who lived in the region at the time of the Spanish conquest in the 16th century. They would have spoken the Chibchan languages (Unlike the Chorotega who spoke Oto-Manguean) and would have lived in dispersed settlements consisting of less than 2000 people. They would have made their living by hunting, fishing and farming. They probably raised such plants as beans, squash, papaya, pineapple, and avocado. How old the spheres are is also a question that is not easily answered. Since rock is not living material it cannot be dated by using a radiocarbon test. However, it is possible to date objects found buried around some of the stones. This is usually pottery. Certain styles of pottery were known to be used during specific periods. This evidence suggests that the stone spheres might have been made as early as 200 BC all the way up to when the Spanish arrived in the 16th century, a range of 1800 years. While this is most likely set of dates, it is possible that at least in some cases the stones were made earlier, then moved, or reshaped at a later date which was then associated the pottery style of that era. Probably the most difficult question to tackle is "what were these stones sphere used for?" Given that we have no written records from the culture that made them, the best way to figure out their purpose would be to see how they are positioned in relation to each other and other archeological artifacts like buildings and walls. However, most of the balls have been moved from their original sites at this point and there are few, if any, records about exactly where they were found. There are some documents suggesting that groups of the spheres were found in geometric arrangements like lines, triangles and parallelograms. However, since they are no longer in these positions it is impossible cannot confirm these accounts or make new measurements These stories, however, have led to speculation that they might have been used as compasses, or to make astronomical observations. Another theory is that the balls were used as status symbols. According to John Hoopes, of the University of Kansas, who visited the stones in an effort to have them protected as a Unesco World Heritage Site, "the making and moving of the balls was probably an important social activity, perhaps more important than possession of the finished product�We believe that the balls may have sat in front of the houses of prominent people, perhaps as a display of power, of esoteric knowledge, or of control over labor." There are records indicating that some spheres were found on the tops of mounds which might validate the idea that they were to be displayed as symbols of great status. Ironically, today the balls, some of which now sit in as diverse locations as the private residences of the wealthy in Costa Rica to the court yard of Harvard University's Peabody Museum in Connecticut, may still be doing their original function: Marking the properties of the rich and powerful.